Perform every task in your small to medium-sized office from a single powerful and affordable device. Use the MP 3555 Black and White Laser Multifunction Printer (MFP) to print and copy black-and-white output at up to 35 pages per minute (ppm) in PC, Mac®, Linux® and host printing environments. Create and distribute full-color scans with multiple scan-to options. With the fax option, you can send paperless faxes directly to email inboxes. 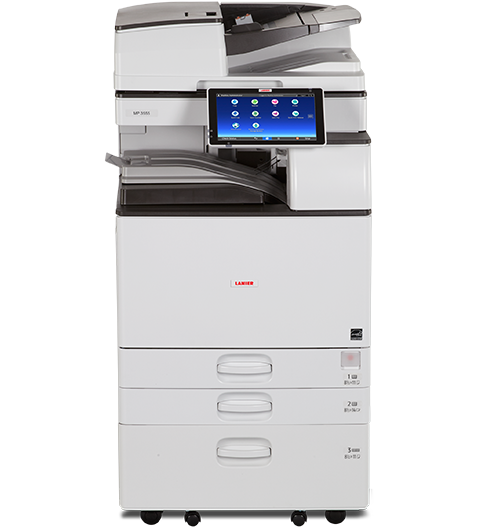 Simplify how you load multi-page documents for faster copying, scanning and faxing. Use the economical 100-sheet Automatic Reversing Document Feeder (ARDF) version to scan originals with ease. Choose the Single Pass Document Feeder (SPDF) version for even faster, two-sided throughput at up to 180 images per minute (ipm). Take advantage of easy-to-use touchscreen controls to navigate the 10.1" Smart Operation Panel. Designed with Workstyle Innovation Technology, it offers multiple user interfaces for both sophisticated and simple tasks, so you can find information easily, share it quickly and move on with your workday. Use the embedded web browser to grab information from websites and cloud-based storage applications and print it instantly, or save it to a storage device. Skip manual steps. Access workflow apps from the Application Site to automate everyday tasks, such as scanning documents to a SharePoint® server or scanning two-sided documents onto one side of a sheet of paper. Download helpful how-to videos. Create icons on the Smart Operation Panel for specific workflows, so you can initiate shortcuts with a single tap of your finger. Choose between multiple optional finishers to reduce outsourcing costs. Save floor space with affordable internal finishers, make saddle stitched booklets with an external booklet finisher or select a unique hybrid finisher that can accommodate both stapleless and stapled output automatically depending on the number of pages per set. Store up to 3,000 files on the Document Server for frequently used files. Add Optical Character Recognition (OCR) scanning to create keyword-searchable PDFs. Use GlobalScan™ NX, Nuance® AutoStore® and other optional workflow software applications to reduce manual tasks. Issue chargebacks with optional Device Manager NX Accounting. Add Streamline NX® or @Remote for centralized administration of your entire fleet.